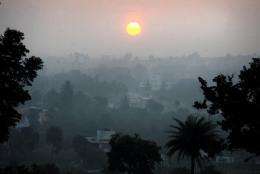 Air pollution and haze cast a blanket over a residential area of the southern Indian city of Bangalore in December 2009. India has the worst air quality in the world, beating even its neighbour China, according to an annual survey based at Yale and Columbia universities in the United States. Of all the countries surveyed in the Environmental Performance Index (EPI), which measures the effects of polluted air on human health, India ranked the lowest at 132. The study used satellite data to measure air pollution concentrations. The level of fine particulate matter in India is nearly five times the limit where it becomes unsafe for humans, said the study released at the recent World Economic Forum in Davos, Switzerland. Health experts say particulate matter is one of the main causes of acute lower respiratory infections and even cancer. India scored a meagre 3.73 out of a possible 100 points in the air analysis, lagging way behind Bangladesh, the next-worst performer, which scored 13.66. The region fared poorly with Nepal, Pakistan and China taking up the remaining spots in the bottom five of the rankings. They won't have this distinction for long. China will get the title sooner or later and probably keep it. As of May, 2010 China has started to embark on setting up clean air legislation (to be implemented by 2015). I don't think India could match that in that timeframe - even if they wanted to. I wouldn't count them out. India is a developing nation and shows major economic progress. It all comes down to willingness though. Let's set aside for a moment that India has shown itself to be a mostly dysfunctional country and focus on the comparison of India to China. You are saying that India, a country far worse economically, slower growing economically, an expanding impoverished new generation, higher population density, etc etc etc. - Will surpass china in any way whatsoever in the foreseeable future?